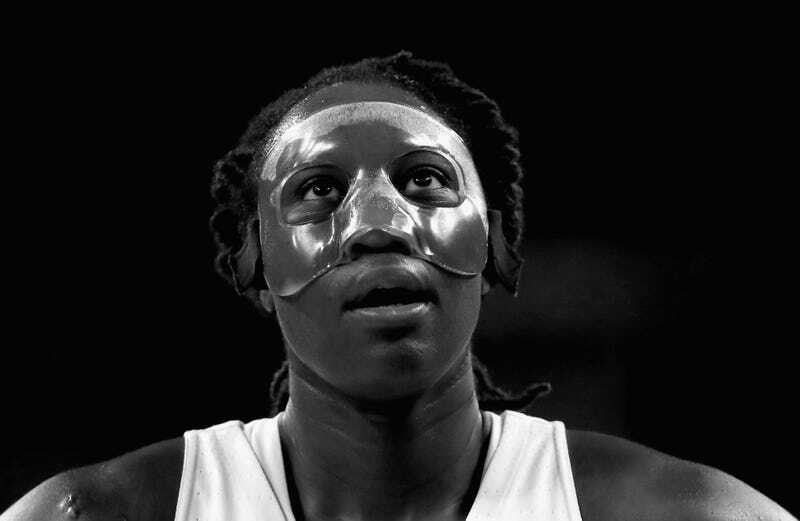 Tina Charles Came Home To Win A Title. Instead, She Wound Up In Exile. You can understand Tina Charles’ season with the New York Liberty, her hometown team, by watching the final two possessions of last Thursday’s game against the Washington Mystics. The Liberty trailed, 77-75, with ten seconds to go. Charles received the entry pass just inside the paint, guarded by a pair of Mystics, and 6'5" Elena Delle Donne came over to make it a trio. It didn’t matter—Charles turned and flicked the ball over the three Mystics and into the hoop to tie the game. But that left Delle Donne with seven seconds to spare, and LaToya Sanders set a pick on Charles, the obvious choice to defend Delle Donne, as the Mystics inbounded the ball. That left precisely no one to cover Washington’s best shooter, and she sank a three at the buzzer. Later on, the Mystics would wonder aloud in the locker room how the Liberty had left Delle Donne, the league leader in player efficiency rating and one of the WNBA’s biggest stars, wide open. Charles began jumping up and down unhappily before the ball had even gone in. She knew what had happened to her team in that moment, because she’d seen it before. The Liberty have planned around Charles without providing her with another star to help shoulder the burden of bringing home a championship. That’s not how the title contenders have been built in this league, not for a long time now, and it’s not working, though Charles has made it work better than you’d expect. The Minnesota Lynx, 2011, 2013, 2015 and 2017 WNBA champions, have four Olympians from the 2016 USA Basketball team—Maya Moore, Sylvia Fowles, Lindsay Whalen and Seimone Augustus. The 2016 champion Los Angeles Sparks have the 2016 league MVP in Nneka Ogwumike, two-time MVP Candace Parker, and a future MVP in point guard Chelsea Gray, among other stars. The 2014 champion Mercury feature both an all-time great in guard Diana Taurasi and Brittney Griner, who is redefining the ceiling for a WNBA center. But since Charles pushed for and was granted a trade to the New York Liberty prior to the 2014 season—the Connecticut Sun got forward Alyssa Thomas, center Kelsey Bone, and a first round pick in exchange—she has been the team’s lone star. For years, mostly because of Charles’s brilliance, it worked well enough that the Liberty stayed among the league’s elite. So far this year, it hasn’t. Even after a win Sunday night in Chicago, the Liberty are just 5-11, and if the season ended today, would miss the playoffs. Definitely in White Plains, baby. The Liberty built around her and used Charles as linchpin of one of the league’s top defenses. Offensively, they surrounded her with shooters, got some bigs to do the heavy lifting on the boards, and let her go to work. And that plan nearly worked in 2015. The Liberty went 23-11, finishing atop the Eastern Conference. They’d traded Cappie Pondexter, a ball-stopping scorer, for Epiphanny Prince, another New York prep legend and a tremendous scorer in her own right. (She’d once scored 113 points in a high school game and was one of the few stars of Charles’s caliber to come out of the city in some time.) They had young Brittany Boyd to run the point, Tanisha Wright and Sugar Rodgers from distance, Kiah Stokes and Carolyn Swords to crash the boards. That was a good team, but after Charles led the Liberty into the Eastern Conference finals, Boyd got hurt. This left the Liberty without a point guard against Tamika Catchings, who was the last one-player star to lead her team to a WNBA title back in 2012, and the Liberty lost to the Fever in a decisive Game 3 at The Garden. There just wasn’t enough resilience built into the roster, and the proceeding years played out like reruns of progressively diminishing quality. In 2016, Prince suffered a season-ending knee injury, Charles led the Liberty to a 21-13 mark and the three seed anyway, and then Taurasi, Griner, and the Mercury came to The Garden and ended their season. The next year Boyd missed almost the entire season, Prince returned a step slower, and Charles still led the Liberty to ten straight wins, a 22-12 mark overall, another three seed—and another loss in the playoffs to the Mystics. Delle Donne had 18 and 10 and newly acquired long-range bomber Kristi Toliver finished with nine threes and 32 points. The faces had changed, but little else was different. The WNBA is filled with teams that would have actively worked to maximize Charles’ Hall of Fame prime, but the Liberty haven’t been able to get it together enough to really get started on that work. The WNBA is filled with teams that would have actively worked to maximize Charles’ Hall of Fame prime, but the Liberty haven’t been able to get it together enough to really get started on that work. The constant chaos that is the Liberty organization cost them dearly this past offseason. In November, Liberty owner Jim Dolan, just a few years after pledging his fealty to women’s basketball as part of his unforgettable decision to hire Isiah Thomas (yes, that Isiah Thomas) as president of a women’s basketball team, announced that he would be selling the Liberty. Had Dolan cared a bit more about the future of the franchise, he’d have likely waited until said sale was complete to announce it. But Dolan simply wanted out and said so. A few months later, when no one met his preferred asking price for a team he’d already said he no longer wanted, Dolan moved the Liberty out of The Garden—which holds 19,763 and routinely drew 10,000 to Liberty Games—to the Westchester County Center, capacity 2,300. Besides selecting Kia Nurse, a talented two-way player who is not yet a consistent scorer, with the tenth pick of the draft, the move to Westchester was the only big move the Liberty made all offseason. When you are extremely in White Plains. A combination of change of venue—one longtime WNBA observer pointed out that simply dressing in the cramped County Center quarters, rather than preparing to play in The World’s Most Famous Arena, could lead to a decline in focus—and improvement elsewhere around the league meant that coming out flat quickly left the Liberty with a ton of ground to make up. Team defense, once exceptional, is 10th in the 12-team league in efficiency following the games of July 1. The Liberty have plenty of size, but rank seventh in rebounding percentage and dead last in block percentage. They turn the ball over more than all but three other teams. Even so, the Liberty have come a heartbreaking handful of points away from their typical contending form. Six of their 11 losses have been by single digits, with two of those coming on buzzer-beating three-pointers. Smith talks often about small moments that have contributed to these narrow defeats, but there’s another side to that math. Only four times all season has someone other than Charles led the team in scoring, and it has been a different person each time. A consistent second threat would not only allow Charles more room to operate, but could swing the outcome from defeat to victory in these close games. Right now, that strong second just isn’t there. After hearing the cheers of thousands on the court she dreamt of playing on back in Queens, Charles now finds herself playing miles north of the city and with no guarantee that the Liberty will even remain in the area come 2019. As a result, Charles faces another crossroads in her career. She’s only signed through the end of the season, and after hearing the cheers of thousands on the court she dreamt of playing on, she now finds herself playing miles north of the city and with no guarantee that the Liberty will even remain in the area come 2019. Multiple sources familiar with her thinking made it clear that she won’t demand a trade in-season, but not one WNBA talent evaluator I spoke to was quite sure who’d say no to a deal between the Liberty and Mystics. Charles could play for her former Connecticut coach, Mike Thibault, with whom she’s still close. The Mystics could package some young players and picks—perhaps forward Ariel Atkins, guard Tierra Ruffin-Pratt, next year’s first rounder, and Emma Meesseman, an elite post player missing this season for overseas commitments—and put opponents in the impossible position of single-covering either Charles or Delle Donne. It wouldn’t be a bad deal for the Liberty, as they could start over with some young pieces, their own lottery pick—they’d be a lock without Charles—and Washington’s pick. On Friday night in Westchester, Charles tried to will her team to victory. On her first possession, she sank a three—in lieu of consistent perimeter options, she has added range to better reflect the modern game, and improved her efficiency above even her MVP campaign in the process. She drove through double teams. The third time down the floor, she tipped a rebound to herself and finished. She facilitated out of the high post—her assist percentage peaked at 23.4 in 2016, and consistently mirrors that of a guard, not a 6-foot-4 interior scorer. She finished with her right hand and her left with efficiency and ease. She’s somehow shooting 49.5 percent from two this year, her best mark since 2012, even without any effective spacers on the floor. Tina Charles played like Tina Charles, in other words, but she did so against a Chicago Sky team that has multiple all-stars: Stefanie Dolson, and Allie Quigley, and Courtney Vandersloot. They added a pair of lottery picks to that mix, and of those Diamond DeShields is already a star and Gabby Williams soon will be. Charles scored 24 points. The Sky won, 103-99. When it was over, Charles made sure to high-five every teammate. Smith pointed out that when Charles’ frustration spills out, as it did in Washington, it is always self-directed. Only a bit of pounding one fist into the other as she headed to the postgame huddle at center court betrayed her frustration, what she later described as “me being pissed off, me being moody.” When the huddle dispersed, she stood near Prince, two New York City schoolgirl legends on a court 45 minutes by Metro-North train from their hometown, discussing how to solve what might be an unsolvable problem.